That raceday Lasix – by the way, a uniquely North American thing – is primarily used to make horses faster is a pretty good bet. (While not all trainers particularly like it, practically all, so as not to cede any competitive ground, use it.) But what if the Romans/Violette crowd is also correct – that pulmonary bleeding is inherent in a racing-horse? Translated, this would mean that the “sport’s” fundamental physical action universally causes some level of pain or suffering. Of what other basic sporting motion can this be said? Throwing a baseball? Swinging a golf club? Kicking a soccer ball? If not for the deadly seriousness of it all, these people would be laughable. Posted in Drugs, Recommended, Sport?. Patrick, excellent post. Oh, and I have had pro-racing folks say that their horses run “clean” even though it is easy to ascertain that their horses are running on Lasix (Equibase). Not all states require bute to be listed in the charts but all states do require that Lasix be listed. It has always bewildered me that these people, whose horses are “loved” and are just like “family”, can’t seem to admit that Lasix and bute are BOTH drugs…yes, BOTH are drugs. Are they in denial, or are they delusional, or are they just plain dumb? I have no idea but, for some reason, these folks seem to struggle with the truth…the elusive truth. Remember the motto of the racing industry…drug them and run them. So very sad…. Horses on Lasix can become dehydrated, heat stroke or the combination of both. Dehydration is severe fluid loss through sweating and urination. If the water is not replenished sodium and potassium rise to toxic levels resulting in cramping, nausea, headache and finally a coma or even death. For every 1 hour of walking in the heat of the day, a human can sweat off 1 to 2 quarts of fluid. Imagine how much a horse will sweat off in an hour of walking, training, racing. Symptoms are excessive thirst, dizziness, nausea and they will lose strength, pass out and the little fluid that is left in their body is being diverted to their vital organs. If only the horse could tell you how thirsty he is, if only the owner, trainer, or jockey would lead their horse to water, he would drink. How many more youngsters have to die before its realized that Lasix will lead to dehydration, high sodium and potassium levels can cause cramping of the muscles, and what is the heart? The largest muscle in your body, hence heart attack, death. 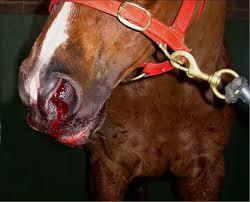 This is a death sentence to your Thoroughbred racing horse, hence your cash cow. As Patrick would say, this is horseracing. When a horse becomes overheated, it is dehydrated, and may have a heat stroke or the combination of both. Dehydration is severe fluid loss through sweating and urination. If the water is not replenished sodium and potassium rise to toxic levels resulting in cramping, nausea, headache and finally a coma. For every 1 hour of walking in the heat of the day, a human can sweat off 1 to 2 quarts of fluid. Imagine how much a horse will sweat off in an hour of walking, training, showing. Symptoms are excessive thirst, dizziness, nausea and they will lose strength, pass out and the little fluid that is left in their body is being diverted to their vital organs. If only the horse could tell you how thirsty he is, if only the owner, trainer, rider would lead their horse to water, he would drink. How many more youngsters have to die before its realized that the heat, stress, pain being inflicted onto the horse will lead to dehydration, high sodium and potassium levels can cause cramping of the muscles, and what is the heart? The largest muscle in your body, hence heart attack, death. With the Lasix ban for juveniles ending with this past weekend’s Breeders’ Cup and a trend toward keeping the drug raceday legal in the U.S., I thought it appropriate to revisit these words written by equine veterinarian Sid Gustafson in The New York Times a couple years back (10/28/11). At the time, Gustafson believed that Lasix was on its way out. Excellent comment and factual information Carolyn Hyatt – thank you! Absolutely, Patrick. And to think, the bleeders that DO manifest their EIPH with epistaxis are a very small percentage – one study as low as 0.15% but at most, only 1% to 2%! So when your weekly casualties lists have several horses’ names listed as returning with “nose bleeds”, we can be certain that there were more that bled, as well! – and bled through their performance-enhancing Lasix! Thank you Patrick for all that you and your followers are doing to expose the crimes in the “sport” of horse racing. Patrick, I hope you don’t mind that I recycled this excellent article. I really think it needs to be revisited again. Please indulge me and I’m so sorry that this article is so long, but I just couldn’t shorten it up. I’m re posting this amazing article, containing facts, about Lasix because a very good friend of mine passed away last week. His name is RUDY TURCOTTE. Rudy was always under the shadow of his famous brother who rode Secretariat Ron Turcotte. However, Rudy was just as talented, but also very OUTSPOKEN when he saw things going awry within the industry. I guess you can say that Ron and I had something in common. Later in years (long after his riding was done) he came down to Florida and lived with us on our farm in Ocala. He was an incredible horse person. It was during our talks around 5 AM in the barn, sipping coffee, sitting on a bale of hay, while the horses were chomping on their breakfast oats, that he told me some stories that should have been a warning sign to me, to the industry and to anybody who cares about racehorses. On May 5, 1978 Rudy was riding a mare called EASY EDITH. He was vying for the lead when Easy Edith snapped her front leg-off and went down. It caused a chain reaction killing a jockey called Robert Pineda, seriously injuring another and Rudy was in the hospital with a broken collarbone. Here’s where things begin to get ugly and this is a pattern by members of this industry to shut up outspoken people like Rudy and me. According to Rudy, he had some reporters come right to his bedside to get his side of the story. He told the reporters that the horse racing industry must get a handle on this or there will be lots of racehorses dying and lots of jockeys dying as well. Please be advised that Rudy claims that many of the articles published at the time excluded what he said under pressure from powerful people, but that this was the most reflective article that was posted minus the details. In fact, he was told if he wanted to save his riding “career” that he had to claim that he was under the influence of pain medication and that when he said these statements they were mostly untrue – no kidding! He went on to tell me that there were immediate repercussions from his statements with the majority of pressure coming from the HBPA (Horseman groups). They fervently defended the trainer while inadvertently defending the use of Lasix in racehorses. After all, they have a vested interest in being able to shove a needle into a racehorses jugular vein 4 hours prior to racing when they supposedly have a heavy hand into the drug testing barn/process while collecting billions in wagering profits via the Interstate Horse Wagering Act. Nevertheless, this was a turning point for Rudy. It’s no secret, and his family acknowledges, that Rudy had a lifetime battle with alcoholism. That said, Rudy told me that when he saw this business for what it really was it ignited his alcoholism. I believed him then and I believe him now. Rudy gave me a first hand account on how he became acquainted with Lasix. It was when he rode his first “lasix” horse, but didn’t know that the horse was on Lasix. He describes the horse as breathing really weird during the race. He felt the sweat and heat actually coming off of the horses lungs nothing he had ever seen in a horse before and he rode plenty of horses Lasix-free. Anyways, he kept riding, and he won. He found out that the horse was on Lasix. He tried to rally the jockey’s union into total disclosure of all drugs, being putting into racehorses, prior to a race for both the racehorses safety and the jockey’s. Again, the powerful HBPA, horseman’s groups, fought back hard, and we know where this ended. Evidently, his outspoken approach caused a riff with his brother Ron who decided to keep silent, maintain his riding career and didn’t join the outcry to have this immediately addressed – according to Rudy. So Ron was getting plenty of mounts and always did after Secretariat’s Triple Crown win. 2 months later after Rudy’s spill, on July 13, 1978, brother Ron Turcotte went down and was paralyzed from the waist down for the rest of his life. He never once mentioned or addressed the use of Lasix or drugs in racehorses always claiming that his horse was simply thrown off balance out of the starting gate. In the barn that morning on my farm in Ocala, Rudy made the claim that Lasix is ruining the bone integrity of racehorses, and he also believed that it’s being passed on to the foals. Rudy, wherever you are, you are 100% right. I hope that there are horses there in heaven because I know you loved them which is why you left the business knowing the reality of what happens to them. Gina – Interesting that you happened to bring this up today. There are 2 articles in Paulick report today that pertain to this. One is that a few trainers are running successfully lasix free, and the other pertains to an increase last year in racing deaths in the state of Kentucky. The death rate article states that they noted horses are dying younger. DUH. Is anyone shocked at this? But they also admitted that it is possibly due to bone depletion in babies because of drugs-Biphosphantes- being administered to them. Expect this trend to continue, in every state. Unfortunately we can`t read the Washington Post archived article because of their paywall which probably means others can`t read also. We remember when Bute first came into use at our local track in the late 70`s and of the many pills horse people would tube down a horses throat. We were appalled at the attempts to cover up a horses soreness from our local tracks hard surface. You don’t really need to read it Fred and Joan because I pretty much summarized the important aspects of the article and the horrific effects. However, it’s cross-posted on The Tuesday Horse with no wall if you care to read it. Thanks for bringing this to my attention Peggy. You know that facts matter and that Patrick is meticulous at using facts on this site. That said, when you hear these things from jockeys that rode in the days prior to all this rampant drug use they all say the same thing: they are riding a different horse that can’t feel their pain, doesn’t slow down like a natural horse would to protect itself, and just literally drops in the dirt. I’ve ridden all my life, and I continue to pleasure ride and a horse that is natural, not on dope, will always tell you if its sore and/or you can feel it. What’s going on in horse racing today is shameful – its blatant animal cruelty. I’m not trying to defend jockeys because they have a choice and a horse doesn’t, but It puts another perspective on it when seen from a historical past. At the end of the day it was the billions in profit that won over racehorse lives and human safety. It’s time for this business to shut down. It should have been shut down long ago instead of financially propping it up with taxpayers money and casino profits. One can not get Lasix except by RX . But in racing it is readily available, to the nonprofessional and in the injectable form, to boot!!! emergency situation – that goes for humans and animals. Why does racing have the “power” to act as “judge and jury” in the cases of. RX drugs in the possession of, and being admiistered by, nonprofessionals ? For starters, where is the FDA as well as vetrinary oversight in all this?? P.S Not only does racing have self- granted “immunity” from the most basic animal cruelty laws but it sure looks like the same applys to basic drug “laws”, too..
Peggy, I read both articles on the Blood Horse yesterday. Mary Scollay, Chief Kentucky veterinarian conspicuously omitted the doping/vet records leading up to these catastrophic breakdowns. Nevertheless, she didn’t demand or subpoena (which she has the power to do) the doping records for all horses who died on their tracks. When a predominant portion of FACTS are missing from their conclusions than the conclusion means nothing. Furthermore, things will never change as they continue to protect their secret doping records, their massive death lists both on the tracks and on the slaughterhouse floor all for $2 bets.